The Chambers of Xeric, also known as Raids 1 – is Old School Runescape’s first raid which can be found within Mount Quidamortem, to the far west of the Great Kourend on Zeah. The fastest way to get to the Chambers of Xeric is to use the Xeric's Talisman, an untradeable talisman which is dropped by Lizardmen. You can also get there via the mine cart system with the Lovakengj House, or simply take the long path through the Lizardman Settlement, west of Shayzien’s Wall. 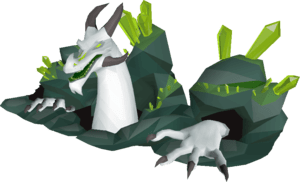 There are no requirements to enter the Chambers of Xeric, however it is considered end-game content and it’s highly recommended to have high combat stats. Throughout the Chambers of Xeric, there are various methods of utilising other skills so it would be an advantage to also have high stats in fishing, cooking, hunter, herblore and woodcutting. The Chambers of Xeric, along with the Theatre of Blood is considered by many to be one of the best pieces of content in the game to be undertaken by a group of players, like a clan or a group of friends. The raid is programmatically generated upon entry, meaning it is different every time you enter, and some of the bosses are extremely challenging and the potential for massive rewards upon completion of the raid like the legendary Twisted Bow can make it very exciting. It does however have quite a steep learning curve and in order to do raids efficiently, it’s very beneficial to have enough GP to buy lots of high-level gear. There are various different tactics players can use to gear up for Raids, one of the most common and easiest ways to efficiently gear is to use Void or Elite Void armour. Using Void allows you to bring less gear and more food and potions, making it ideal for beginners and for players who do not have a lot of GP for expensive gear. A great resource for players looking to learn to raid as part of a group is the We Do Raids discord, where there are regular Raids run for players of all levels – including absolute beginners. It’s highly recommended to have a Rune Pouch to save space on Runes, the fight against The Great Olm requires someone in your party to bring Runes for water spells. It’s highly recommended to have the Salve Amulet(ei) for the fight against the Skeletal Mystics. It’s highly recommended to have a Dragon Pickaxe for the fight against The Guardians. A Rune Pickaxe will do. It’s highly recommended to have a Dragon Warhammer or a Bandos Godsword, for defence-reducing special attack for use against Tekton. It’s highly recommended to have access to the Rigour Prayer, which requires a prayer level of 74 and the prayer must be unlocked with the Dextrous Prayer Scroll. Through the use of 3rd party Old School Runescape clients like Runelite, it’s possible to accurately predict exactly which puzzles and which bosses you will come across in your raid. This is incredibly useful if you’re trying to optimize your raid for learning, for speed, or just for fun. For example, some players learning raids may want to ‘scout’ the raid until you find a raid without a particular boss which might be causing you trouble, for example – a raid without Tekton. A great guide for learning how to scout raids effectively can be found here. This Void Learner setup contains all items you’ll need to comfortably try and learn every boss within the Chambers of Xeric. You should aim for this gear setup as a bare minimum. The best resources for learning all of the tactics within the Chambers of Xeric is the Old School Runescape wiki page. For anyone looking to learn the Chambers of Xeric as part of a group, the We Do Raids discord is a fantastic place to start. This 30m tribrid setup is an improvement upon the void setup. Once you’re comfortable taking fewer supplies and more gear into the Chambers of Xeric, you should strive for this setup. This 100m tribrid setup is an improvement upon the void setup. Once you’re comfortable taking fewer supplies and more gear into the Chambers of Xeric, you should strive for this setup. This 300m tribrid setup is an improvement upon the void setup. Once you’re comfortable taking fewer supplies and more gear into the Chambers of Xeric, you should strive for this setup. This 700m tribrid setup is an improvement upon the void setup. Once you’re comfortable taking fewer supplies and more gear into the Chambers of Xeric, you should strive for this setup. This 1000m tribrid setup is an improvement upon the void setup. Once you’re comfortable taking fewer supplies and more gear into the Chambers of Xeric, you should strive for this setup. This max tribrid setup is very expensive with the inclusion of the Twisted Bow and the Ghrazi Rapier.